You Netflix review: Inside the creepy new psychological thriller. The thrilling new psychological drama on Netflix that you'll want to binge immediately. Now that we’re almost at the end of the year, Netflix is really pulling out the big guns when it comes to offering up loads of new movies and TV shows. Along with a slew of must-watch new movies, including Dumplin‘ and Bird Box, the streaming giant have also released a number of new bingeable TV shows. The latest bingeworthy series to be dropped? YOU. While the series’ promotional images may lead you to believe we’ve got another teen rom-com on our hands (we’re looking at you, To All The Boys I’ve Loved Before), YOU takes a slightly more creepy turn. In fact, rather than a love story, YOU is more of a psychological thriller. The ten-episode series, which originally premiered on Lifetime in the US, is based on a novel of the same name by Caroline Kepnes. The series follows bookstore manager Joe who becomes besotted with aspiring writer ‘Beck’ after crossing paths with her. “Using the internet and social media as his tools to gather the most intimate of details and get close to her, a charming and awkward crush quickly becomes obsessed as he quietly and strategically removes every obstacle – and person – in his way,” Netflix’s official synopsis reads. 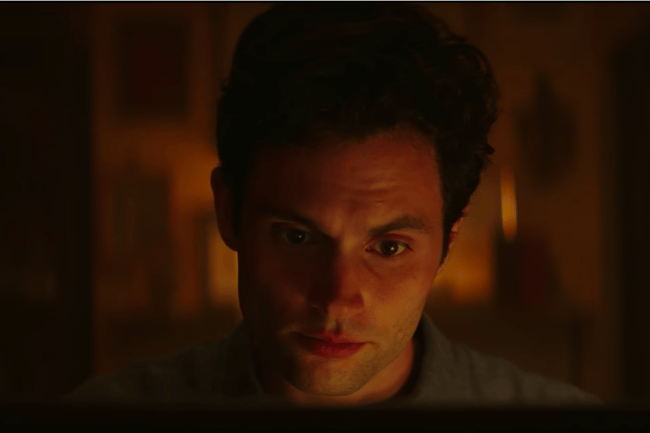 The show’s main character, Joe Goldberg, is played by Penn Badgley. The actor is most famously known as playing Dan Humphrey in long-running series Gossip Girl. Beck is played by Once Upon A Time actress Elizabeth Lail while Pretty Little Liars actress Shay Mitchell also co-stars. Since dropping on Netflix on Boxing Day, the thriller has become popular with many Twitter users. Not even 10 minutes into #YOU on Netflix and I’m hooked. Netflix’s new show #You is so dark and I love every bit of it. There’s this series called “You” on Netflix ????????????????????????????????. 10 mins in and it tells a huge story about how through someone knowing your name, they can easily get to know everything about you and eventually date you based on what you share on Social Media. YOU is finally out on Netflix! I’ve been waiting almost 2 years for this I swear hahaa! YOU is available to Australian Netflix users from December 26, 2018.